This article is about Constellation Records (Canada). For other uses, see Constellation Records (disambiguation). Constellation Records is a Canadian independent record label based in Montreal, Quebec. It has released albums by many post-rock bands, including Godspeed You! Black Emperor, Thee Silver Mt. Zion Memorial Orchestra & Tra-La-La Band and Do Make Say Think. The package of the Godspeed You! 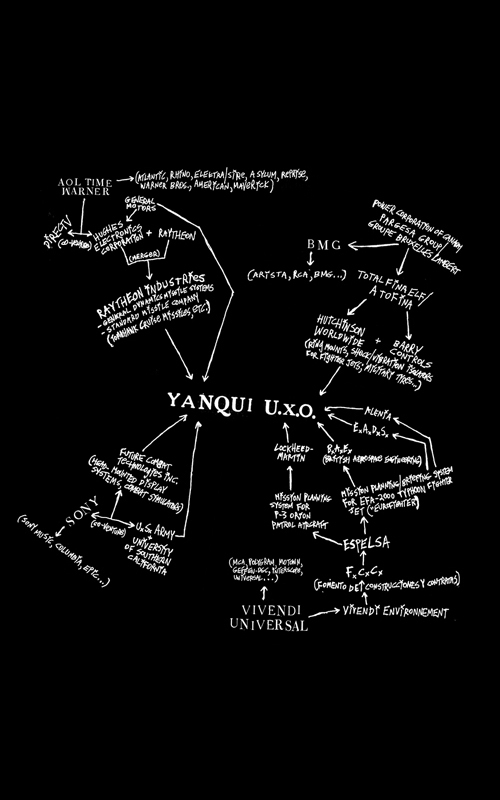 Black Emperor album Yanqui U.X.O. was especially noteworthy, containing an extensive chart which demonstrated the links between four major record labels—AOL Time-Warner, BMG, Sony, Vivendi Universal—and various arms manufacturers. The band later apologized for some extensions of the chart, conceding that some of their research had been inaccurate. On 25 February 2010, Constellation Records founders Ian Ilavsky and Don Wilkie signed, together with 500 artists, the call to support the international campaign for Boycott, Divestment and Sanctions against Israeli Apartheid. ^ "A Note On the Artwork for Godspeed You! Black Emperor's Yanqui U.X.O." Archived from the original on 2003-04-09. Retrieved 2009-04-18. ^ "Tadamon! » 500 Artists Against Israeli Apartheid". Tadamon.ca. 2010-02-25. Retrieved 2015-03-18. 2004 Interview with Don Wilkie, co-founder of Constellation Records (ARTNOISE/DFB). Chart from Yanqui U.X.O. packaging Archived from the original on 2008-10-22. Retrieved 2013-01-21. This page was last edited on 21 April 2019, at 15:17 (UTC).